(Photo: . 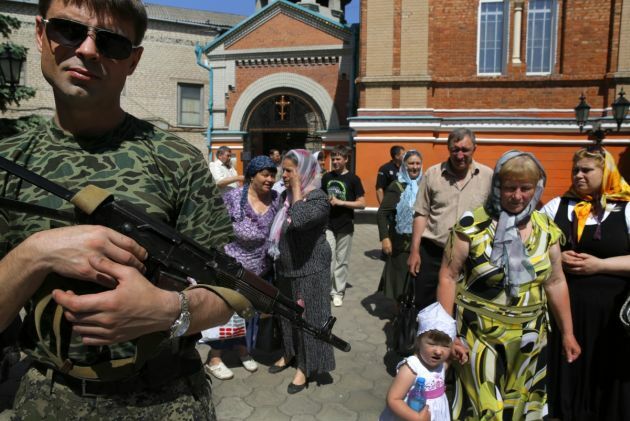 REUTERS / Yannis Behrakis)An armed rebel stands near local Christian Orthodox believers exiting from Alexander Nevski Cathedral following a Sunday Mass at the eastern Ukrainian town of Slaviansk May 18, 2014. Ukrainian Greek-Catholic bishops from around the world, meeting in Lviv for their annual Holy Synod, have appealed to the international community to help restore peace in Ukraine. "Ukraine is flowing with blood!" the bishops began, noting the "direct military intervention" in Ukraine by Russia, Vatican Radio reported Friday. Meanwhile, Ukrainian Prime Minister Arseniy Yatsenyuk accused Russia of wanting to "eliminate" his country and restore the Soviet Union, the BBC reported Saturday. It said there were reports of heavy fighting near the airport in Donetsk, one of the main rebel-held cities despite there being an official ceasefire between Ukraine and Russian-backed separatists. Yatsenyuk said Ukraine is "in a stage of war" with the "key aggressor" being Russia. Ukraine and Western countries accuse Russia of intervening on the side of pro-Russian rebels in eastern Ukraine but Moscow denies this. For their part the bishops also decried the "unprecedented level of hatred and distortion" taking place in the media. "The entire world has been able to witness how, over the last months, the aggressor commits crimes against humanity on the territory of Ukraine," referring to the intentional downing of Malaysian Airlines flight MH17 in July, in which 298 people were killed. Religion in Ukraine tends to align along ethnic lines with Orthodox Christianity the biggest group followed by the Ukrainian Greek Catholic Church. Estimates compiled by the independent Razumkov Centre in a Ukraine nationwide survey in 2003 found that 75.2 percent of the respondents believe in God and 22 percent said they did not believe in God. A total of 37.4 percent said that they attended church on regular basis. A 2006 Razumkov Centre survey indicated 14.9 percent of believers identify themselves with the Ukrainian Orthodox Church - Kiev Patriarchate which is estranged from the Moscow Patriarchate. A further 10.9 percent are adherents of the Ukrainian Orthodox Church (Moscow Patriarchate) (which has the largest number of churches in Ukraine and claims up to 75 percent of the Ukrainian population. The 2006 survey found 5.3 percent belonged to the Ukrainian Greek Catholic Church while 1 percent identified themselves as Protestants. It also found 62.5 percent, of Ukrainians who now number 44 million stated they are not religious or did not clearly identified their church allegiance. Many Ukrainians who identify themselves as Orthodox were unsure of which church they were affiliated. In their report the Ukrainian Greek-Catholic bishops noted that many people suffer from lack of medical assistance, thousands have been kidnapped and tortured, and hundreds of thousands of refugees have been forced to flee their homes. "If these crimes are not immediately stopped with the onset of the winter cold, the death toll will increase tenfold," the bishops have warned. They also warn that, those attacking Ukraine "will not hesitate tomorrow to turn their weaponry against anyone, in their own country and beyond its borders, or attack any other nation in the world." In this context, the bishops have appealed "to the consciences of believers of all denominations and faiths... and all people of good will, to heads of state and members of the international community: 'Stop the bloodshed in Ukraine!'" The bishops also appealed to world leaders to fulfil their responsibilities by taking the necessary actions "to restore peace and security in Europe." They also renewed their call to all believers and people of good will for "urgent prayers for the end of aggression and the restoration of a lasting and comprehensive peace in Ukraine."